Mine was the December 2009 selection of Film Movement Canada, a subscription service that brings the best of independent cinema to your door each month. Though it’s only recently launched here, Film Movement has operated in the US for several years, and has long been one of my favourite sources of great films. Mine is screening theatrically around the US until the end of March 2010 (more information) and will be available through iTunes this month, too. 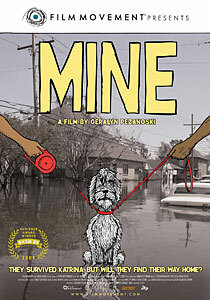 Mine (Director: Geralyn Pezanoski): Winner of the Audience Award at the 2009 SXSW Film Festival, Mine is a gut-wrenching look at some of the forgotten victims of 2005’s Hurricane Katrina: pets and their owners. My wife and I are thinking of becoming dog owners, and after watching this film, I’m more convinced than ever that pets really do become part of the family. In the aftermath of Hurricane Katrina, thousands of evacuees were forced to leave their cats and dogs behind. Shelters wouldn’t accept animals, and in some cases, people left their pets thinking they’d be gone just a few days. We all know what happened. Many people still haven’t returned to the city, and those who did had to wait months. In the meantime, more than 150,000 animals died. Thanks to the efforts of volunteers, several thousand were rescued, but many were shipped to other states, and when their owners didn’t claim them within a few days, some were adopted out to new families. This is where the film gets really interesting. The failure of the government to adequately respond to the catastrophe has been the subject of many fine documentary films, but in this case, ordinary people around the country stepped in to do all they could to rescue these pets who’d been left behind. Unfortunately, there is a political edge to some of these “rescue” organizations, as some of the former owners soon found out. For instance, many dog owners in New Orleans don’t have their dogs spayed or neutered, whether for financial or cultural reasons. Among the rescue community, this is considered irresponsible. As well, many of the rescued animals turned out to have heartworm infections, something that can be prevented with medication. Again, probably due to financial hardship or simply ignorance, many New Orleans residents hadn’t treated their pets for heartworm. The end result was that many of the rescue organizations saw the original owners as negligent, and after treating the animals for sickness, they would spay or neuter them and then adopt them out to more “suitable” families in their areas. When the original owners were finally able to track their pets down, the rescue organizations would tell them that their pet had a new family, and the new family didn’t want to give it up. We follow several of these heartbreaking custody battles throughout the course of the film. Though it’s only hinted at, race and class are central to how the stories are played out. Since pets are considered property under the law, it should simply be a matter of having one’s property returned, but in the emotional battlefield of pet ownership, things are rarely that simple. Having already survived the hurricane and the loss of their homes and possessions, the residents of New Orleans have no money to hire lawyers to pursue their missing pets, so a number of volunteers help them to find lawyers who are willing to work pro bono on the cases. It’s an ugly process, and one particular phone conversation (part of which appears in the trailer embedded below) between the owner of a missing dog and the head of the rescue organization who got him out of New Orleans sums up the film in a nutshell. People who love animals can often forget that there is a person attached to that animal. If you care about animals, you cannot pretend that that relationship never existed. You don’t have to be a dog lover to enjoy Mine. And even if you think you’ve seen all there is to see about Hurricane Katrina, don’t let that keep you away from this insightful film, which has exposed the class divisions of our society more clearly than anything I’ve seen in a long time. This entry was posted in Documentaries, DVD, DVD Clubs, Film Movement and tagged class, hurricanekatrina, pets, race. Bookmark the permalink.